We're hopeful that spring is around the corner and warmer days are ahead! In the meantime, we thought it would be fun to share some inspiration to help with spring-like thoughts! 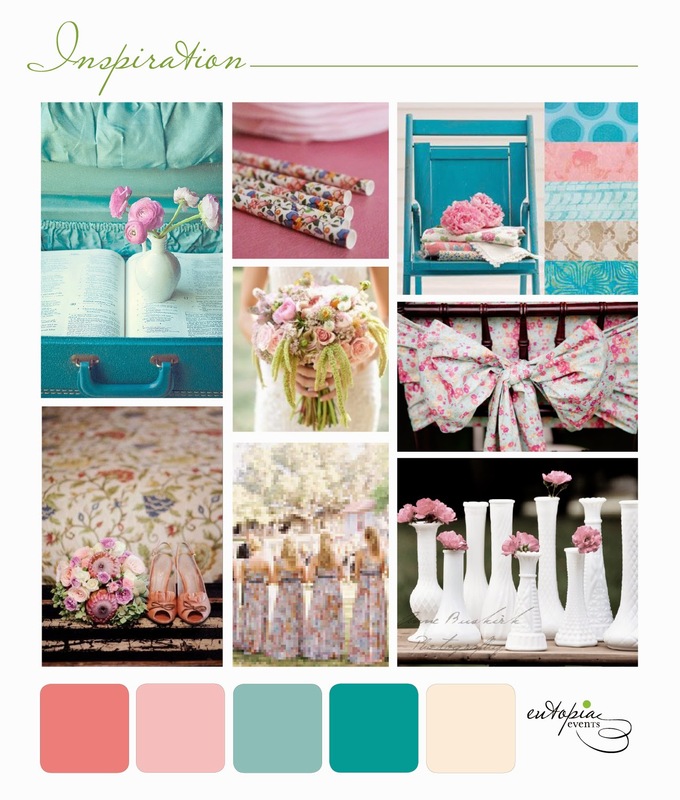 This inspiration board is made up of various shades of pink and turquoise with a mix of floral patterns. Stay tuned for photos from a styled shoot we did based on this look! While the bulk of the work we do is related to weddings, we do love to create beautiful setups and lasting memories for other types of events. 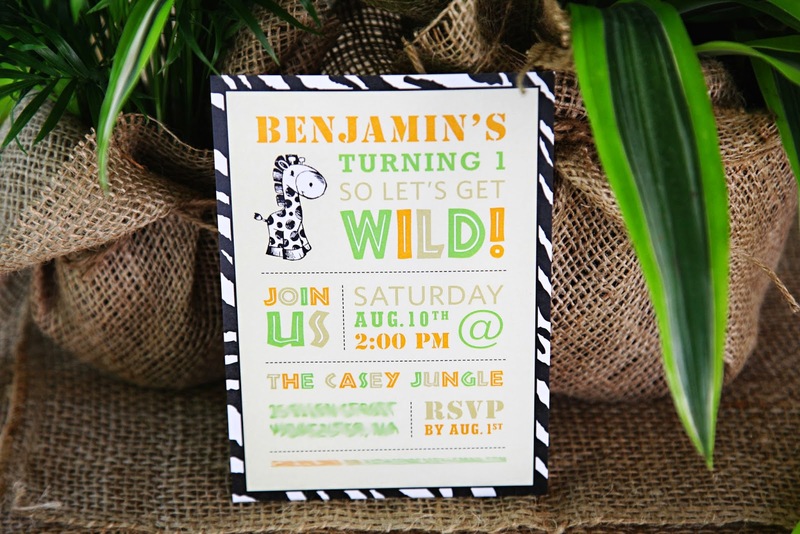 We "went wild" when Katie reached out to us for help planning and designing her son's first birthday party! Since it was going to be an outdoor celebration with guests aging from little babies to grandparents, we came up with a safari theme which is suitable for all ages. We used a simple color palette of browns and tans, with pops of lime green and orange, mixed with wood textures and animal prints. 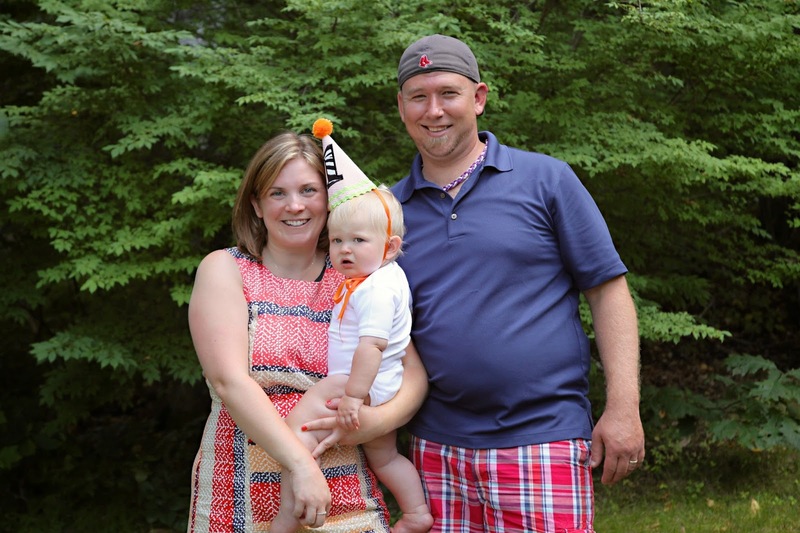 Check out some of the images from Benjamin's Safari-themed first birthday party, as seen through the lens of the talented Cronin Hill Photography. You can also see more of this party on the Hostess with the Mostess blog, one of our absolute favorites. It is an honor to see our work featured with them! Invitations: We custom designed the invitations to reflect the theme of the celebration, and carried this design throughout the other party stationery: the labels used on the goody bags, drink labels, menu sign, and memory book sign. Desserts: The cake, cupcakes, and individually packaged sugar cookies were created by Cakes by Amanda. We gave her the theme, color palette, some props we were using, along with some inspiration photos and let her run with it. They matched the rest of the décor perfectly! The cupcake liners even had animal print on them. Drinks: Another way we showcased the safari theme was through the beverages. We had two drink dispensers filled with juice — one orange and one green — and appropriately named them “jungle juice” and “swamp water.” We also took mini bottles of water and simply covered the labels with animal print duct tape and put them in a zebra striped galvanized tub with ice. 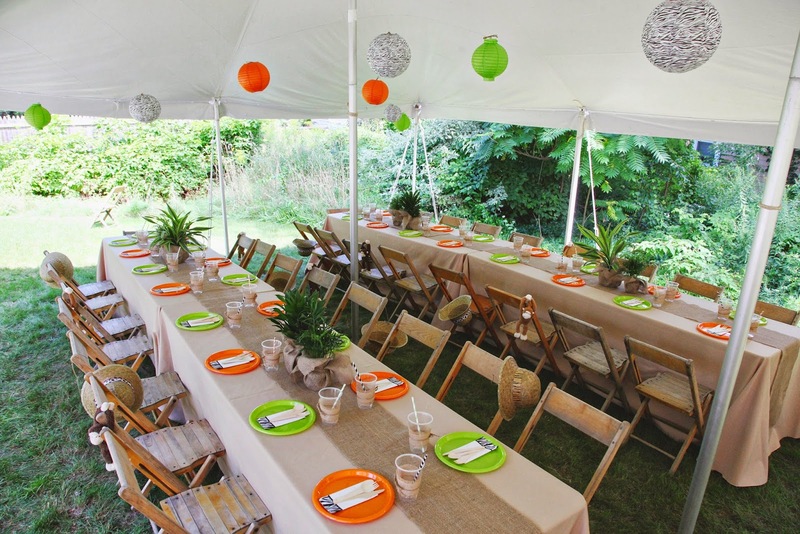 Tables: Each table was set with reusable plates in orange and lime green, a zebra striped napkin, wooden utensils, and clear cups adorned with jute, twine, and cute paper straws. A simple strip of burlap was used for the table runners over khaki colored cloths. The centerpieces were a mix of small and medium sized potted tropical plants from a local garden supply that we easily covered with burlap. All of the chairs were rustic, wooden, folding chairs that used to be part of a traveling carnival and were supplied by Eutopia Events. 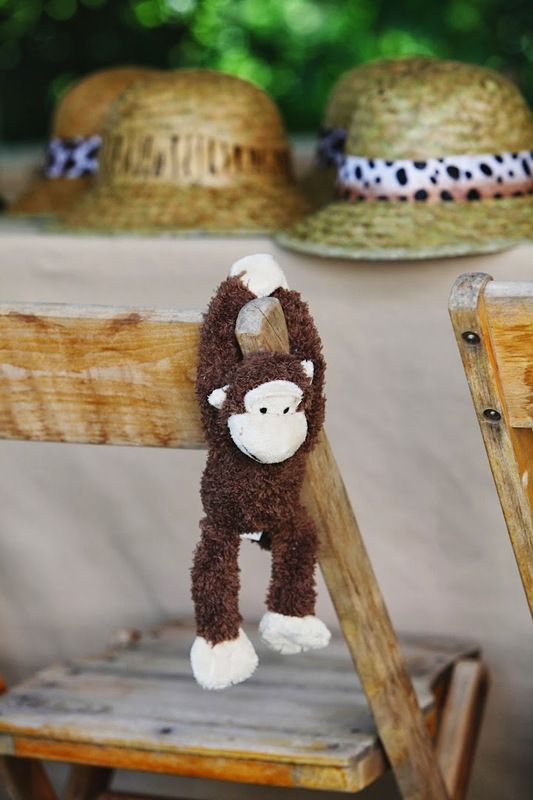 Little stuffed monkeys and safari pith helmets hung from various chairs to decorate the space, as well as to play with and take home as favors! Goody bags: Boys and girls ranging in age from just a few months old up to age 12 attended the party. Each child was given an age appropriate activity bag filled with safari themed goodies! Some of the items included were jungle animal socks for the little babies, safari themed coloring books, bubbles in orange and green, safari animal stickers and toys, safari craft projects, and puzzles. 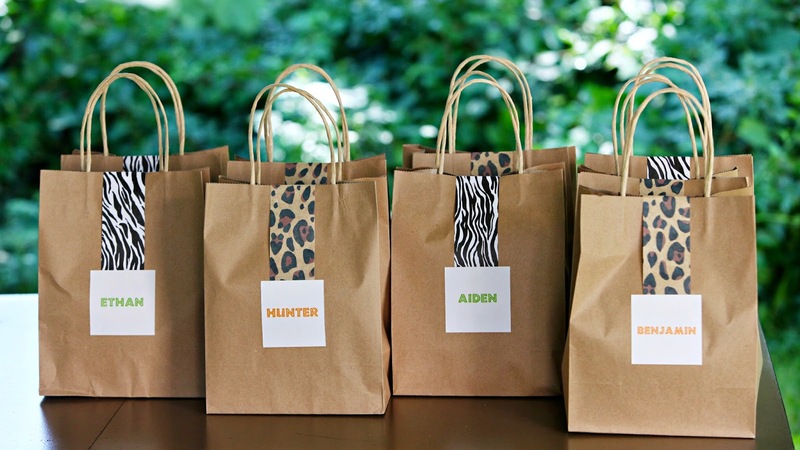 Each bag was made of brown kraft paper and was decorated with a strip of animal print paper and a color coordinated name badge. 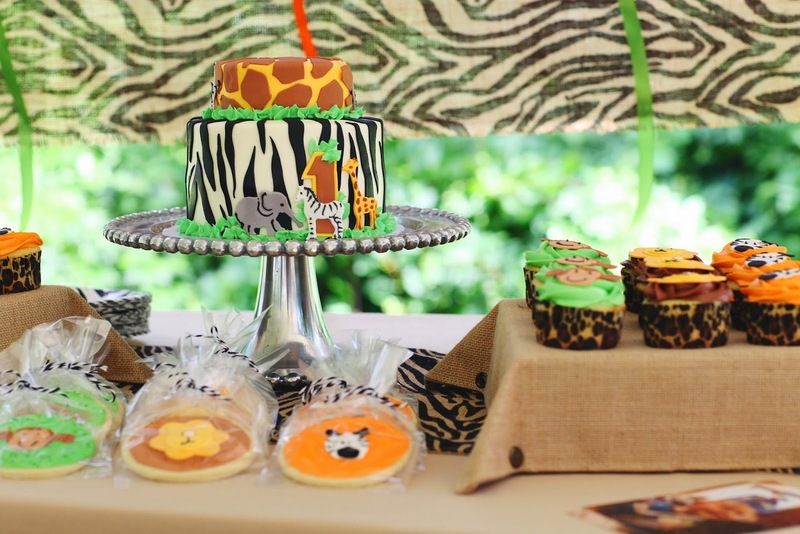 Other décor elements: A burlap, animal print backdrop was created to display pictures of the birthday boy throughout his first year and hung behind the desserts. Green, orange, and zebra striped paper lanterns were used to decorate the inside of the tent. Thank you to the fabulous vendors who helped make this party such a roaring success! 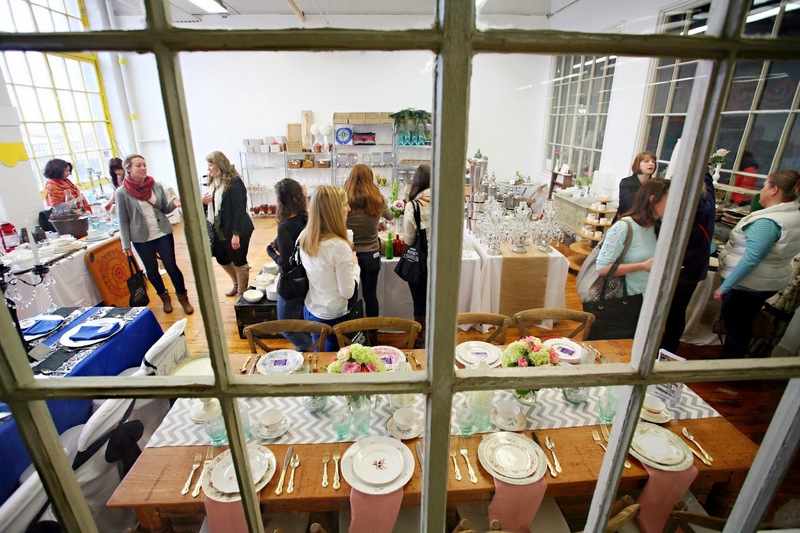 Calling all event hosts and planners! 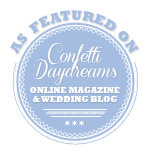 This post is not just for those planning a wedding! 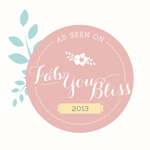 It is for anyone who has ever planned a wedding or event AND those who are currently planning. Couples planning their wedding know what a challenge it is to find décor that fits their vision and budget. 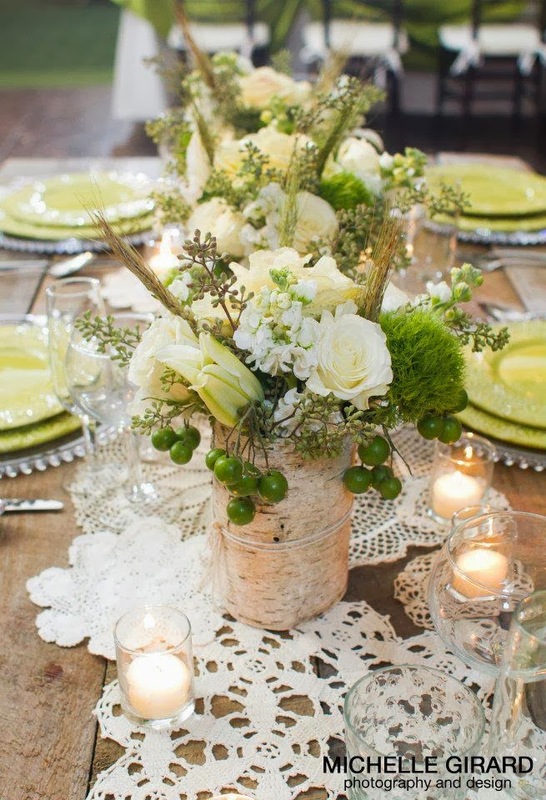 Countless hours are spent locating the perfect centerpiece container or table number only to come up empty handed, frustrated, or over budget. Now imagine walking into a space filled with beautiful displays of gently used wedding items that have been artistically put together to inspire and help you create a distinctive look for your wedding. 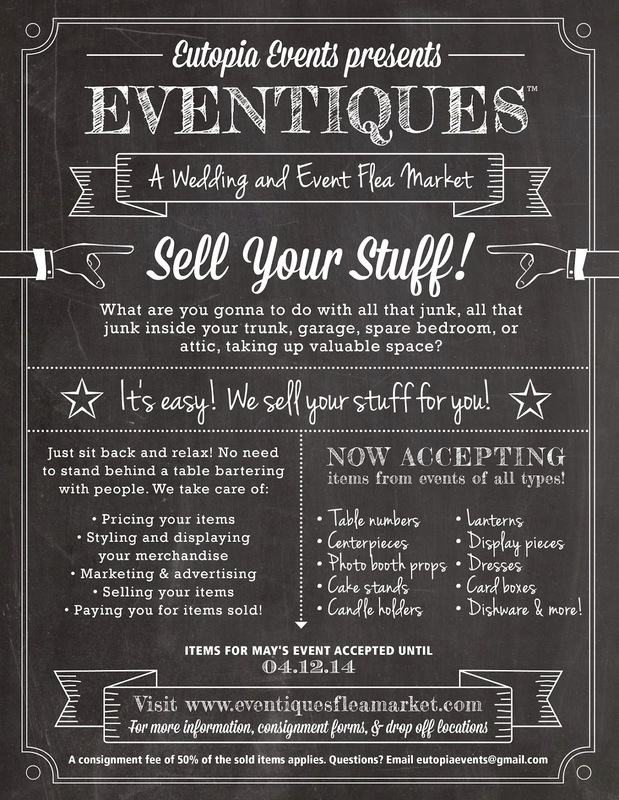 Eventiques, a Wedding and Event Flea Market is a centralized, fun-filled market focused on helping couples and event professionals find decorative elements at affordable prices all in one location. 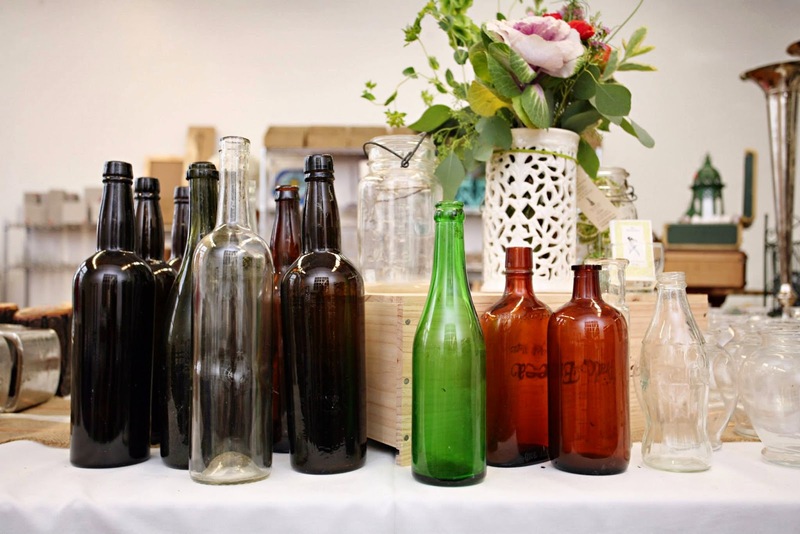 Décor from past events is given new life by being reused or repurposed for another couple’s wedding or someone’s special celebration such as a birthday party, graduation party, baby shower or bridal shower. We created this event to encourage party throwers, both past and present, a greener way of hosting events. At Eventiques, you will find carefully selected used wedding décor, vintage goods, new and used wedding gowns, rentals, and handmade pieces you can buy for your wedding or celebration. Local artisans and merchants will be displaying their handmade goods, perfect for making someone’s wedding or event extra special. In addition, Eventiques Flea Market will have select event professionals displaying their work and will be available to answer your design questions and make suggestions on how to create the perfect look for your celebration! It will be a fun shopping experience but you will also walk away feeling inspired! Join us May 3rd and May 4th at the Eastworks Building, Main Floor, in Easthampton, MA. VIP Tickets are $8.00 each and can be purchased online at www.eventiquesfleamarket.com (limited availability). VIP tickets are for Saturday only and will have early admittance into the event from 9am to 10am. VIP ticket holders will also receive a goody bag with local goods and gifts! Tickets at the door are $5 on Saturday from 10am-3pm and Sunday 10am-2pm. Perhaps you are already married, or have already thrown the ultimate 40th birthday celebration; now what to do with everything? That décor takes up valuable space in your spare room, attic, basement, garage, etc. One hundred of those candle votives that brightened tables, vast amounts of paper lanterns, or the wine cork place card holders you slaved over for hours! Finding the time and energy to sell these pieces can be daunting. But don’t worry, let Eventiques do the work for you! We will be collecting items for consignment until mid-April. If you are a bride, groom, stay-at-home-mom, working parent, party thrower, or event professional who would like information about how you can sell your gently used items, please contact us at eutopiaevents@gmail.com We have several consignment drop offs scheduled, visit our website to find a drop off that works for you. Keep yourself updated as we add new and exciting things to the event! Visit us on Facebook or feel free to contact us with any questions. We decorated the space simply with tones of green, white, and gold, including custom designed stationery, floral arrangements, and mini cupcakes—some were even gluten free! Two of Liz's good friends decorated cookie favors that matched the theme, which everyone enjoyed. Check out some of the pictures from the shower and enjoy! Want to throw a fabulous party but don't know where to start? Contact us for information on how we can help you with your next life celebration! 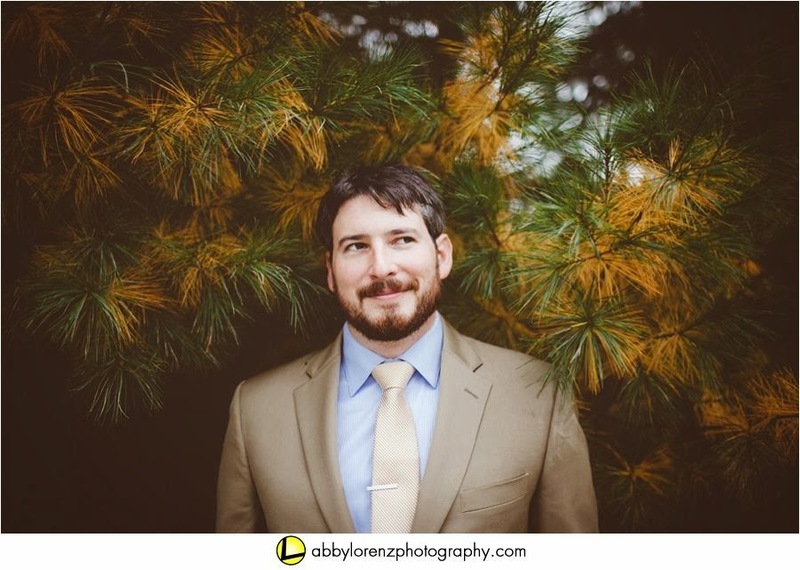 We love traveling wherever we are needed for weddings, so we were excited to get the opportunity to go outside our usual "stomping grounds" into the city for Mara and Adam's September wedding. Though the Boston metro area is not too far from where we are based, it was nice to work somewhere a bit different. 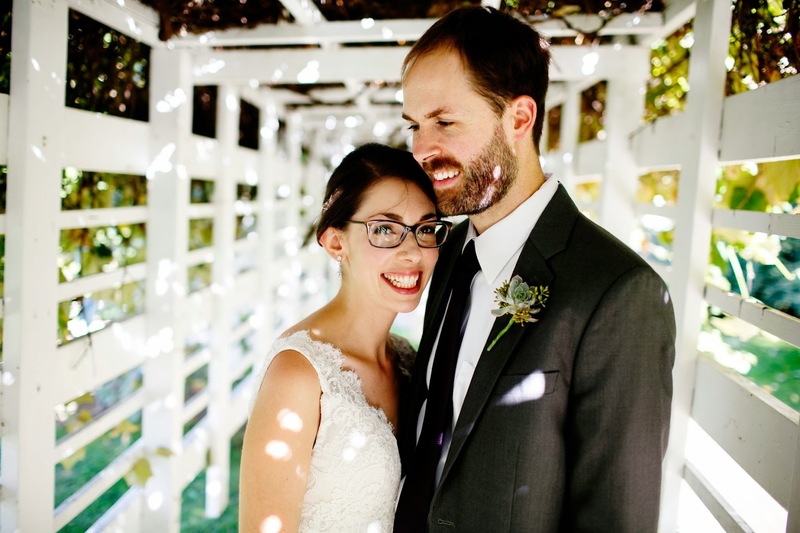 Mara and Adam's ceremony and reception venue fit them perfectly! The Commander's Mansion in Watertown, MA is a beautiful historical building with a rich history dating back to the Civil War. The ceremony was held in the garden, surrounded by a trellis covered in grapevines. Guests could pluck a grape from the vine as they entered and they were quite delicious! Painted barn wood signs directed guests to the ceremony area, where they were greeted with a small table of refreshments to enjoy while waiting for the wedding to begin. A cellist played as guests made their way to their seats. 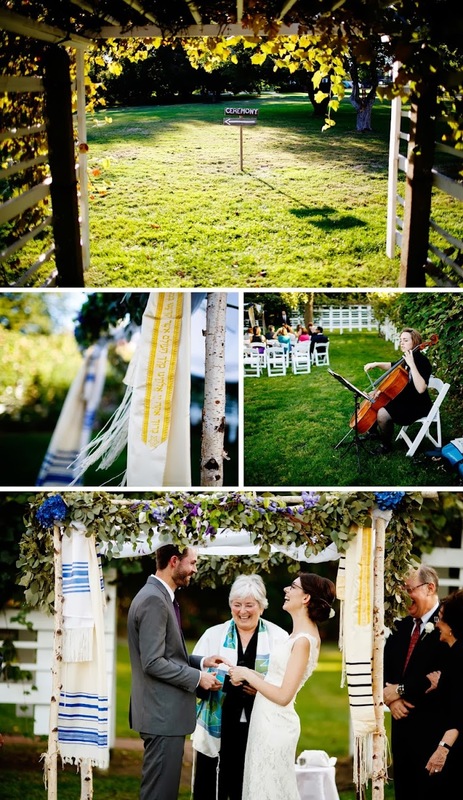 The ceremony incorporated many Jewish traditions, which took place beneath a beautifully adorned Chuppah. Three family tallits were draped over the birch poles of the Chuppah and were decorated with greenery and white and purple flowers from Whim Events. It was the perfect altar for Adam and Mara to exchange their vows. After the ceremony was over, guests were directed to the front of the Mansion where passed hors d'oeuvres were waiting. Their bar was made up of 3 signature cocktails, wines, and an assortment of beers, one of which was brewed by the groom's brother and named "Alex's Brewly Wed Ale." Guests sipped on their drinks and enjoyed the late summer sun before heading inside for the dinner reception. The dining room was dressed in silvery shades of gray and white mixed with purple accents. A mix of vintage glass vases dressed the tables, along with seeded eucalyptus, lithianthus, dahlias, succulents, ranunculus, hydrangeas, hyacinth, and wildflowers, which added texture and color to the monotone palette. It was important for Mara and Adam to create a wedding reception that felt like an intimate dinner party. They opted not to do a formal introduction and had a much more relaxed approach to doing speeches. After the breaking of the bread, guests enjoyed a fabulous dinner put together by Season to Taste Catering. Talk about exquisite food and top notch service! One of our favorite moments of the night was watching the parade of staff bringing plates to the head table, their service was like a carefully orchestrated dance. For dessert, a beautiful pie bar from Petsi Pies was displayed for guests to select their favorite kind, accompanied by the tastiest vanilla ice cream we’ve ever indulged in. Since the mansion is an older building, it was broken up into multiple rooms, as a typical house from the late 1800s would be. Dancing took place upstairs, and it was a nice change of scenery as guests were greeted with an uplit lounge area adjoining the dancing area. We relocated décor from downstairs and created a space perfect for a party. People had a blast dancing to the sounds provided by Kevin of C-Zone, and of course they had the Hora! Adam and Mara had a gorgeous wedding day and we were thrilled to have been part of their day! These two had decided that hiring us for Design and Day-of Coordination would be the best fit for their wedding, and we’re so glad they did. It was a fun and unique venue to work with and the vendors were fantastic. Thank you to Channing Johnson Photography for all of the beautiful pictures! The Berkshires: Quaint, stunning, luxurious, friendly, laid-back, welcoming, the list goes on. If you have ever had the opportunity to visit this gorgeous part of Western Massachusetts, you will agree that the area has a lot to offer. We love the Berkshires and all of it's history and charm. From the prestigious gilded-age mansions, to the arts, the music, and to the breathtaking backdrop of the mountainous terrain. 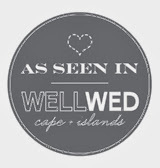 It's no wonder we love the opportunity to help our clients attain the wedding of their dreams in such a perfect part of our little state! That's why we are happy to announce that we are now part of the Berkshire Wedding Collective, a carefully curated collection of the finest wedding professionals serving the Berkshires. We've been doing weddings in the Berkshires since 2010 and were asked to join the Lenox Wedding Tour in 2013. We're no strangers to the the area. Growing up nearby, we've always had an affinity for the Berkshires—a perfect wedding destination spot. We love being part of the tour, bringing wedding planners and media from all over the country to this beautiful location. Our staff was invited to the tour as guests in 2012. Here is a picture from a tablescape we designed at the Lenox Wedding Tour table design challenge. This wedding season, we are thrilled to be working at Hancock Shaker Village, Jacob's Pillow, along with a few events at private estates. 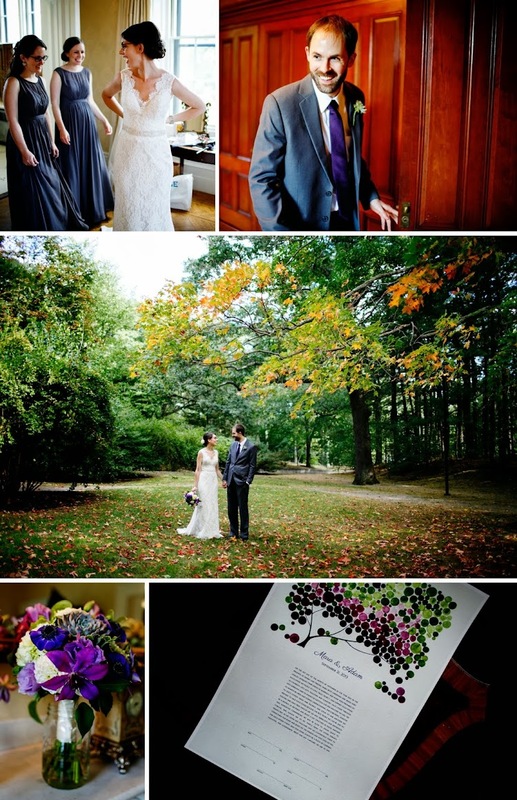 One of our favorite weddings from last fall was held in Egremont at the home on the parents-of-the-groom. Sam and Joy were a joy to work with (yes, pun intended!) and we are so happy we were part of making their wedding day so special! 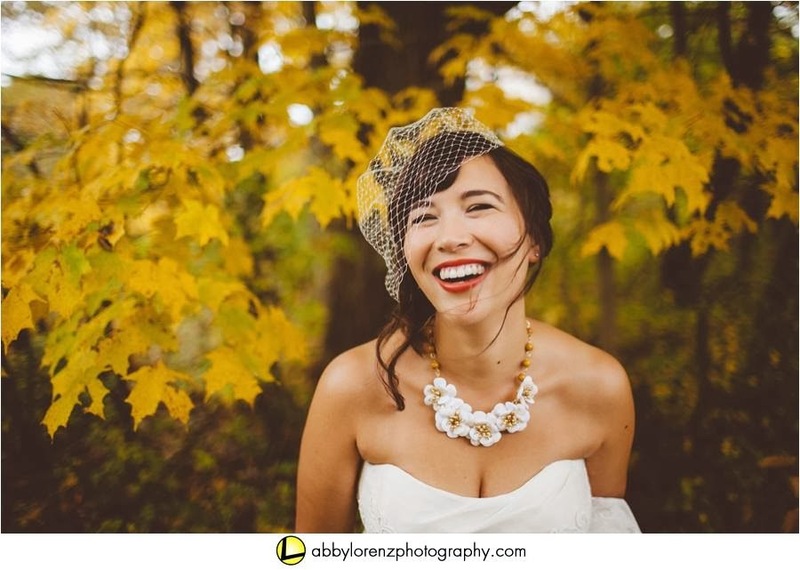 Joy said: "Ruthie and Lauren of Eutopia Events were AMAZING. Honestly I don't think we would have gotten through the day in the same way without them. I found them to be particularly helpful in managing the anxiety that comes with both planning a wedding and doing it backyard/DIY style. They knew exactly what my vision was and were able to execute it and handle any snags without having to interrupt our day. They were also great with helping me think through many of the issues I had been stuck on throughout the planning process. It was especially nice to know that there was someone there to ask questions to when we needed it and someone there to just handle things in general without having to do it ourselves. Overall, they exceeded our expectations, particularly with the amount of work they put into the actual day. I didn't see them stop once! They were absolutely worth the price and totally saved the day!" 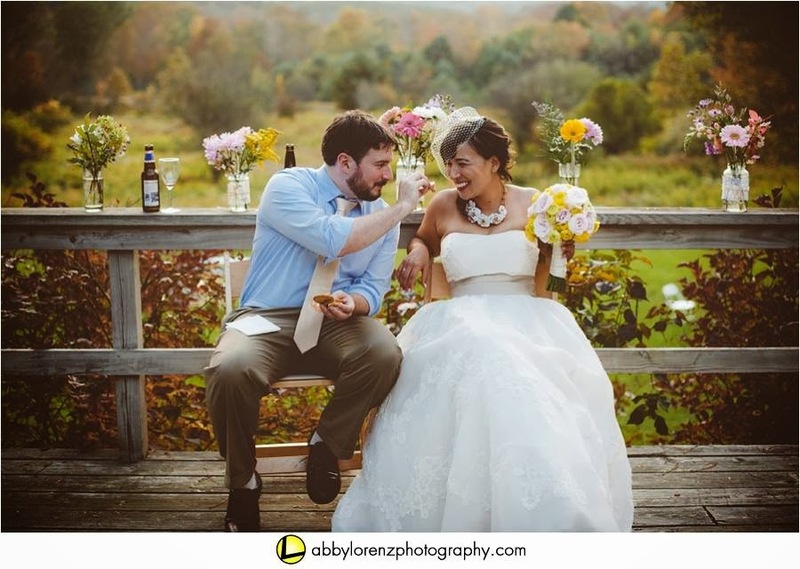 Here are a few pics from their gorgeous Berkshire nuptials from Abby Lorenz Photography. We can't wait to share more with you from this adorable DIY wedding. If you haven't had a chance to visit the Berkshires, you should plan a little get-a-way to the area. Some of our favorite towns include Lenox, Stockbridge, Becket, Lee, Pittsfield, and North Adams just to name a few. It has so much to offer. It is worth considering as the perfect backdrop for a destination wedding. Contact us to learn more about how the Berkshires might be a good fit for your wedding and how we can help make it a reality!